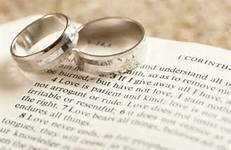 Arrangements should be made with the Pastor at least six months in advance of the intended date for a marriage. The celebration of the rite of Marriage is prohibited on Good Friday and Holy Saturday. In the Diocese of Syracuse, weddings are not permitted on Sunday or after 2:00 PM on Saturday, except for serious reasons and with the written permission of the Bishop or his delegate and the consent of the pastor of the parish. In this parish, weddings are not permitted after 6:00 PM on Fridays. The place for the celebration of marriage is the parish church, unless particular ecumenical or interfaith considerations dictate otherwise, and permission has been granted by the Bishop or his delegate. Weddings that take place in a so-called “Catholic ceremony” at locations such as the Turning Stone Casino, local restaurant/hall, beach, park, etc., before a suspended priest (who as such has no faculties, that is, authorization) are not canonically valid. Although such marriages are recognized by New York State, they are not recognized by the Church. They require convalidation or sanation.